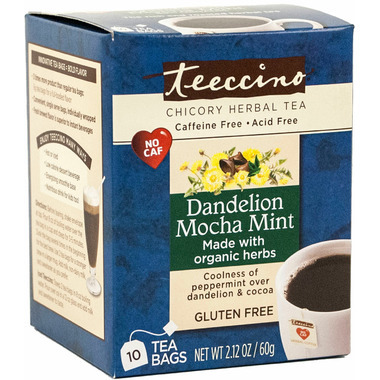 Whether you're a tea or coffee drinker, you'll love Teeccino Dandelion Mocha Mint Chicory Herbal Tea’s satisfying, robust flavour that fans describe as smoother, richer and creamier than coffee. The secret? French chicory, the roasted root often added to coffee, blended with dandelion, the renowned detox herb, and Spanish carob, famed for its chocolaty flavour. 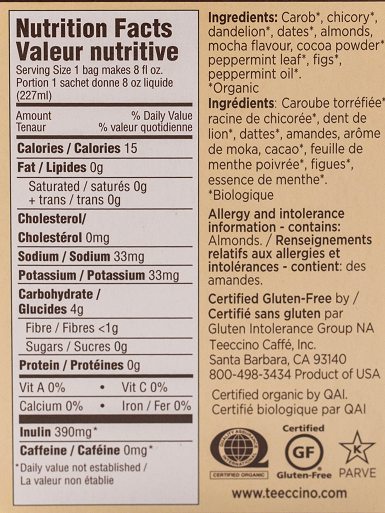 Enriched with California's almonds, dates and figs, and peppermint from the Pacific Northwest, Teeccino makes a delicious cup of tea....or is it coffee? We'll let you decide! Directions: Before tearing, shake envelops at top. Pour 8 oz of boiling water over the tea bag in a cup and steep for 3-5 minutes. Dunk the bag several times in the beginning for the best brew. Use 2 tea bags for a stronger brew in a larger mug. Add milk, non-dairy milk, and sweetener as you prefer. Iced Teeccino: Steep 2 bags in 8 oz boiling water. Pour over ice in a 12 oz glass and add milk and sweetener to taste. I have used Teeccino products for a few years now and substitute them for my 'off coffee' days and in the afternoon when I don't want extra caffeine. I haven't had a flavor I don't like, but I really do love this Mocha Mint! The mint is subtle enough that I can have a huge travel mug and not get tired of the taste. I DEFINITELY recommend all of the Teeccino products if you care about health & clean ingredients, not to mention ORGANIC. Love this tea! Satisfies both my coffee and sweet tooth cravings! Especially the oh so powerful chocolate cravings! Delisious flavour, smooth and yummy. Great price point also ! The mint and chocolate are so good, and the fact that its a non caffeinated non acidic drink makes it a regular purchase for me. Love It!! !